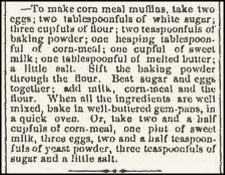 — To make corn meal muffins, take two eggs; two tablespoonfuls of white sugar; three cupfuls of flour; two teaspoonfuls of baking powder; one heaping tablespoonful of corn-meal; one cupful of sweet milk; one tablespoonful of melted butter; a little salt. Sift the baking powder through the flour. Beat sugar and eggs together; add milk, corn-meal and the flour. When all the ingredients are well mixed, bake in well-buttered gem-pans, in a quick oven. 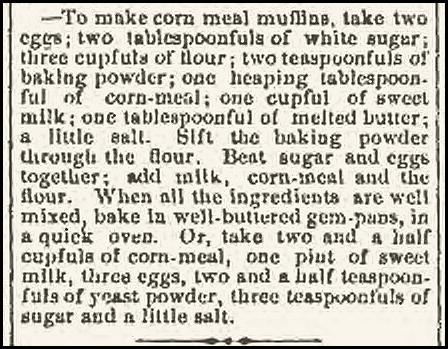 Or, take two and a half cupfuls of corn-meal, one pint of sweet milk, three eggs, two and a half teaspoonfuls of yeast powder, three teaspoonfuls of sugar and a little salt. Sift together, cornmeal, flour, sugar, salt and powder. Rub in lard cold, and eggs beaten and milk. 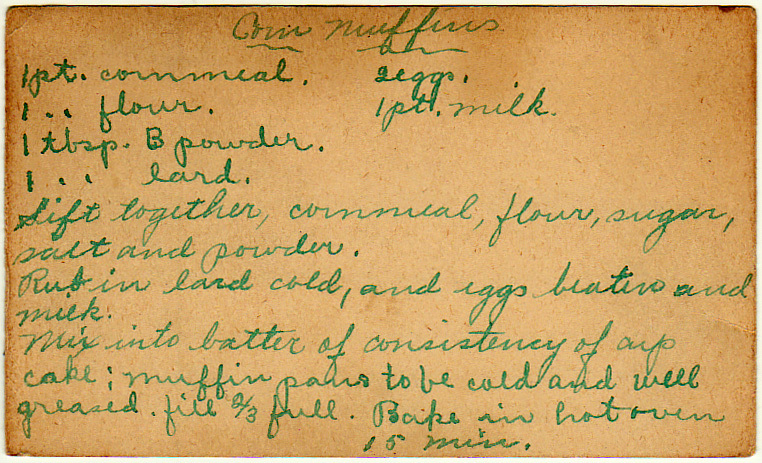 Mix into batter of consistency of cup cake: muffin pans to be cold and well greased. Fill 2/3 full. Bake in hot oven 15 minutes. Generally, 375 to 400 deg. F.
A specific form of pan, sort of like a muffin pan, except with straight sides in the cups, spaces between the cups for air circulation, and traditionally made out of cast iron. The name comes from a specific variation of muffin made from whole wheat flour, often with fruit in it, called fruit gems. A muffin pan, a sheet pan with straight-side ramekins, or a sheet pan lined with ring molds might work as a substitute depending on the recipe.